This local creamery has all your dairy needs. Milk, a wide variety of cheeses, butter, and... ice cream! Grandpa takes Sam and Suzy in for a treat and there are seven delicious flavours to choose from: vanilla, chocolate, strawberry, mint, bubble gum, gold medal ribbon (my favourite ) and the flavour of the month: peppermint swirl. The stable houses the cow and goats that produce the milk. And of course, delivery is available. Here's a final look of the inside. Downstairs you'll find a stove, butter churn, shelve of cheeses, ice cream, a crate of milk bottles, and the cash register. 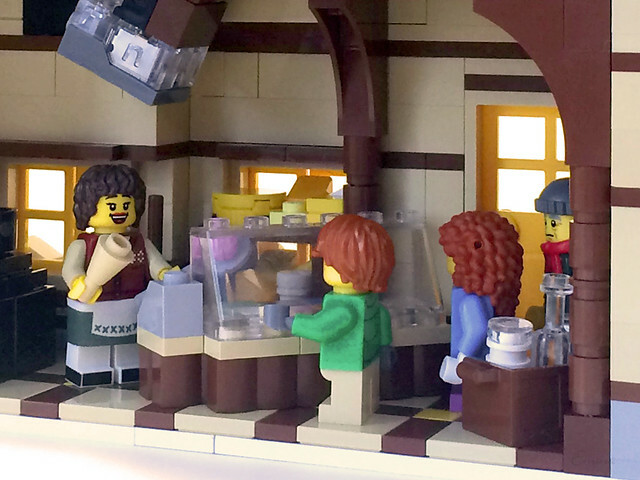 The light brick lights up the selection of ice cream. Upstairs is a shelve for aging cheeses, an ice box for cold storage, and the milk manual with all the super secret recipes for making the best dairy products. My god, that delivery truck is beautiful! Fantastic work here! 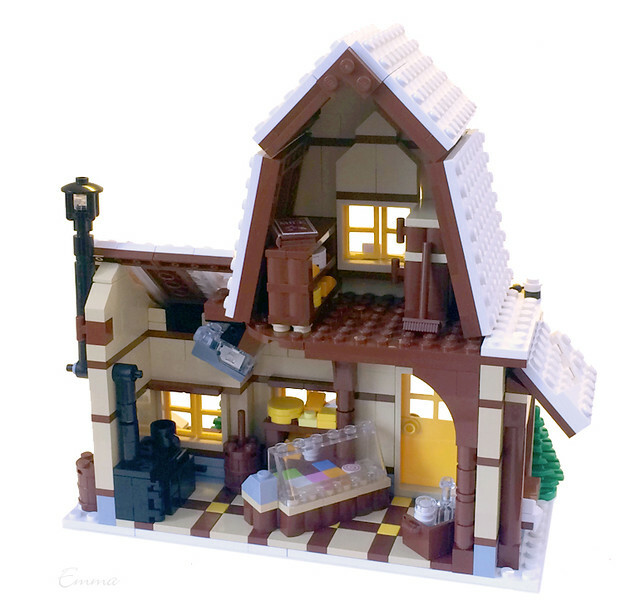 Very nice, looks like a good addition to the Winter Village theme. But, but as a business I think they will have a hard time with only one cow and two goats. Talk about overworked! This is gorgeous! Love the milk bottles and the stove. Very nice! Loved the delivery track! That stove! That truck! The custom decals! Good stuff. I'm sure you'll do well in the contest! Best of luck! This is great! Lovely work on those stickers, they look really good! I have a lot work to do here at the office, but I can't keep my eyes off of all these lovely entries. What can I say, another gorgeous build. The design of the building is great, the stable house is a perfect addition. 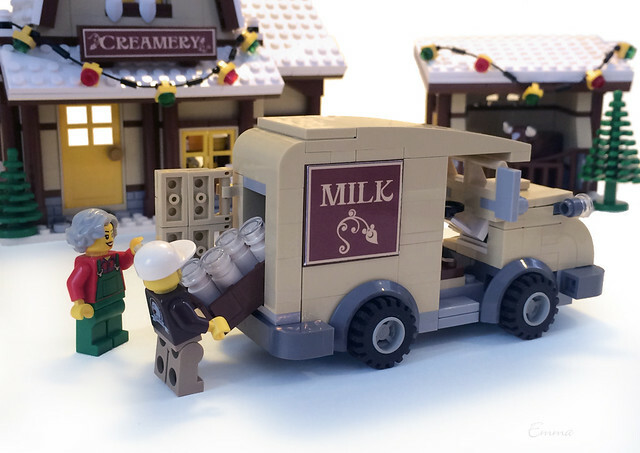 Wonderful details, what with the stickers, milk bottles, truck, crate of straw/hay and so on. It breathes WV all over. Best of luck in the contest, and keep clicking those bricks together. And TWO goats! Now I'm jealous. That's so lovely! I especially like the truck, the oven and the barn. Another entry to my top... 3 I guess atm :D I really like the roof on the building - different architecture makes it original yet perfectly fitting into WV theme. 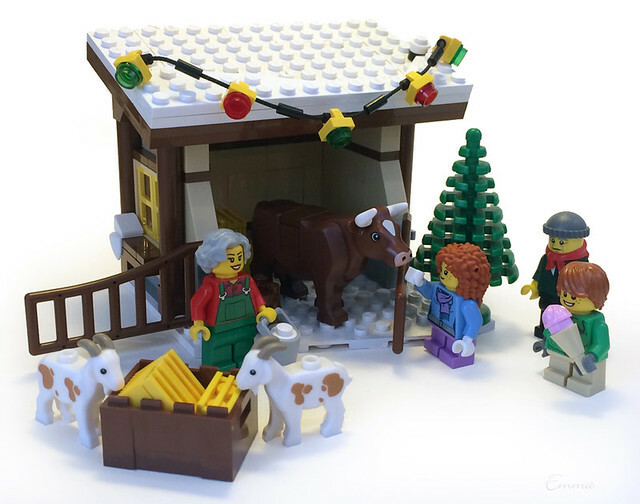 Barn is a nice little addition but that wagon is the star for me :) Well done and good luck in the contest! Thank you everyone for the comments! I'm so glad the milk truck seems to be going over well - that was definitely a challenge for me. ...And TWO goats! Now I'm jealous. Thank you for your comment. 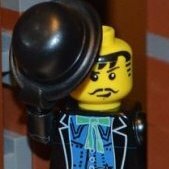 I was very fortunate to get back into Lego very close to when the Mill Village Raid set had just retired, and was able to get it at a decent price. Chickens, goats, and a pig - I couldn't resist. I think we all hold out hope that the goats will make a come back one of these days. I like this! The yellow windows and door seem like they should feel out of place...But yet they don't! This is gorgeous in so many ways. The truck, the stable. The house exterior. A very clean build imo. I sooo love it ! That mini truck is pure win....! I really love this. I love the overall look of all it and think it fits in perfectly with the official winter village sets. I adore the truck, and the custom stickers are really good. 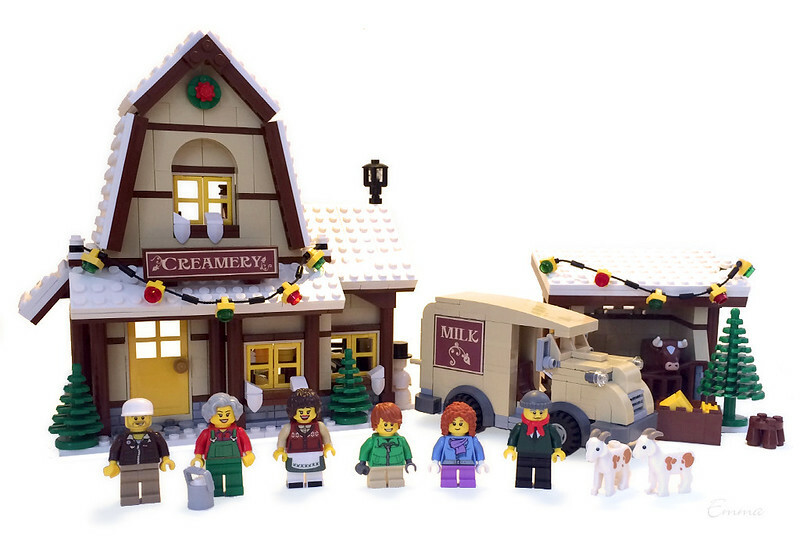 Sweet little mini barn for the animals, nice minifigure selection (esp. the waitress!!) and cute story. I would so love to have this in my winter village!! !